“The Sea of Sameness”–That’s how Jeff Semenchuk, Hyatt Hotel’s new (and first) chief innovation officer and a veteran of Citibank and Pfizer, referred to the mediocrity that creeps in, particularly at big companies, as they get used to business as usual and stop taking chances and distinguishing themselves from the competition. “High, performing field trips” — Robin Willner, vice president of global community affairs at IBM, shared how its corporate service corps sends 500 top performers every year to remote markets for four-month stints to help the locals solve problems. It’s a double win: Employees are stimulated by the new experience, and they get invaluable experience problem-solving in the field while introducing those countries to IBM. “Super computer”–I brought my laptop on stage and explained that while we were talking, it was helping to solve cancer as part of IBM’s World Community Grid, which employs idle computers in scientific research. “Find the right environment”–Levy Restaurants stimulates creativity among its chefs by sending them to different locations throughout the year where they share a kitchen with their peers, feed off one another and are galvanized by a fresh setting, says Alison Weber, its chief innovation officer. Thus, the world’s first beeramisu was born. 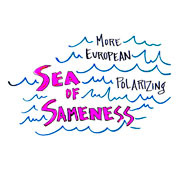 “More European…polarizing”–Chicago chef Paul Kahan says a key ingredient to creativity is being fearless. Some of the most polarizing elements in his restaurants are precisely what makes them so successful. Like the communal dining at Avec and the Publican. It’s an idea he brought back from Europe, where he enjoyed the sense of community as strangers ate along one another at the same long table. “Use data to strategize the sport”–Hank Adams, the CEO of Sportvision, dazzled the crowd by showing what sports teams are doing with the data that his company collects as it tracks every pitch thrown in the Major Leagues. For example, the Chicago Cubs try to help their hitters by analyzing where an opposing pitcher releases the ball on each of his pitches, in this case, San Francisco Giants lefty Barry Zito. “Livestrong started a conversation”–One of the reasons that Livestrong has been so successful, more successful than a typical foundation started by an athlete, says CEO Doug Ulman, is that it helped people with cancer find their voice. Men talked about testicular cancer, which wasn’t previously the case. Survivors recorded videos on the foundation’s site, inspiring others with the same kind of cancer. And the yellow bracelet is what Ulman calls the first form of social media. It’s a way of telling the world you have cancer or know someone affected by the disease. People ask about the bracelet, and the community grows. “Untether from the desk”–Nimesh Jhaveri, executive director of pharmacy services, described how Walgreens has experimented with freeing up pharmacists from behind the counter to out in front of the store. Why keep a medication expert in one place when he or she can be more mobile and accessible to customers? “I love this place! I want to come back! !”–Architect isn’t the design of a space, says Barney, who designed the Riverwalk in Chicago. It’s the design of an experience. That’s what makes someone connect with architecture. It’s visceral. “The greenest menu on the planet”–Chicago chef/food mad scientist Homaro Cantu, who once appeared on the cover of Fast Company, created the most logical way to avoid wasting paper on menus: an edible menu. 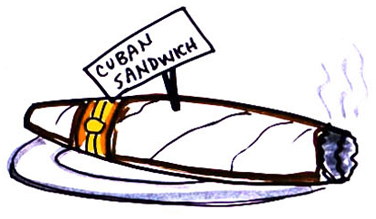 “Cuban sandwich”–Cantu, who relishes playing with our expectations of food, created a Cuban sandwich that looks exactly like a big fat Cuban cigar. 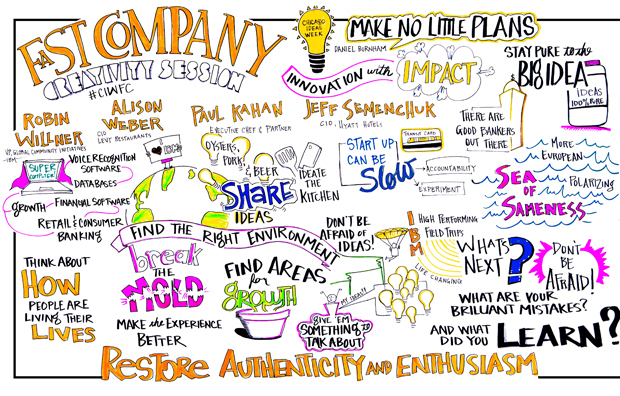 That’s just a sampling of the creativity we explored at Chicago Ideas Week. Check out more on Twitter at #CIWFC. Follow Chuck Salter on Twitter: @ChuckSalter.